Somewhere amidst the rubble fields, graffiti-marked trainyards, and disco clubs, was once the flyest, best kept secret of the entire Bronx during that late 70s era of bell-bottoms and punk. The Get Down, at least how it’s fictionally-depicted in Netflix’s latest hit by the same title, was a place for wordsmiths, b-boys, and DJ funkmasters, like the Furious Five, DJ Kool Herc, and Grandmaster Flash, that ended up pioneering one of the most consequential music genres of our century. With part two of season one quickly approaching, sometime this coming Spring, I had a chance to chat with New York-based composer and executive music producer for the show, Elliott Wheeler – the man responsible for bringing everything together in the score for The Get Down. 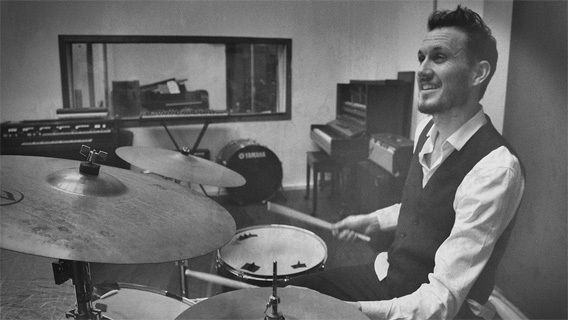 Classically trained at the Sydney Conservatorium of Music, he’s continuously worked with director Baz Luhrmann on a number of ambitious projects, and has collaborated with an insanely long list of artists like Jay-Z, Lana Del Rey, will.i.am, Jack White, Bryan Ferry, Nile Rogers, Nas, and Florence + The Machine. We talk a bit about the vision behind scoring The Get Down, his own personal influences, and the genesis of how this show was brought to Netflix. Jennifer Baugh: I’m interested to know what got you into scoring movies in the first place – before going on to work with Baz [Luhrmann] on The Great Gatsby, and eventually his 2008 film Australia. Elliott Wheeler: I didn’t actually work on the film Australia, it was a project associated with that. But Baz and I did a lot of work together on The Great Gatsby with all of the wonderful musicians he was working with there. The main composer for the film, Craig Armstrong, did an amazing score. I worked closely with people like Bryan Ferry, Jay-Z, and the whole monopoly of people he had involved on that. Then Baz and I did a musical version of Strictly Ballroom as well for the stage, which was an incredible experience and something completely different. We then soon started up running with The Get Down, which has been amazing. But I got into working in film very early. I’ve always loved narrative story-telling in music. I trained classically and had some jazz training, though storytelling for the screen was always something that just really appealed to me. I’ve always been a lover of film, and I got into it very, very early in my career. I’ve been doing it ever since. JB: Was there anything you saw as a kid that made you think about getting into film as a musician? It happened very, very organically. There wasn’t one film that I saw where I said “that’s incredible.” I mean as a kid, I grew up sort of in the era when Star Wars and E.T. and Superman were all coming out. John Williams, he’s just a part of being like a 5-year-old kid — that magic that’s associated with those stories at that age. But since then, some of my favorite music is still film music. Even when I put out my last album, [The Long Time], the inspiration for it I chose was my favorite films from the 60’s and 70’s. It’s just the way I sort of hear and feel storytelling in musical terms. JB: How did Baz first approach you with The Get Down? JB: What’s sort of interesting too is that, I think I read somewhere, this was pitched as a movie initially. What made you guys then decide on doing a series with Netflix? I think for Baz, who’s had this idea for almost 10 years, was really trying to focus on this core concept that had come from this one photo he saw while in Paris of these two kids standing [b-boy stance] in the Bronx, and he was just like what was it that made that particular era produce so much incredible creative output, which would go on to define the next 40 years of popular culture? Initially, it was trying to work out whether he could tell one person’s story. Could it be [Grandmaster] Flash’s story or [DJ Kool] Herc’s or Bam’s? But the more he looked into it, the more he saw that what happened during that period was sort of this collaboration – this inflammation – of all these different forces and pressures, musical styles, artistic styles, and police policies that were coming out of New York at the time. To tell one person’s story wouldn’t really have given the true flavor of what was happening in that period. It was something Baz felt could only be told over the scope of a television series rather than, say, a two-hour film. JB: Was Grandmaster Flash always receptive to the idea of being depicted as a central character in the show? Well, Baz was very aware that this isn’t his story to tell. And he said that to Flash. He told him, “I need to get this right, and you need to tell this story.” So then as it developed, he went back to him and was like “you know Flash, I think we outta put you on the screen.” And he was like “What’re you talking about, Baz?” [Laughs] He loved the idea, but he put Mamoudou Athie, the wonderful actor who plays Flash, through absolute boot camp. All the actors actually had to go through a boot camp. We had a thing called The Dojo out in Glendale – where we had our production offices — and in one corner, we’d have Rich and Tone [Talauega] teaching these kids — who’ve never danced disco before — how to hustle. And, in the other corner, you had an incredible hip hop dance team teaching Shameik Moore how to b-boy like he was back in ’78. 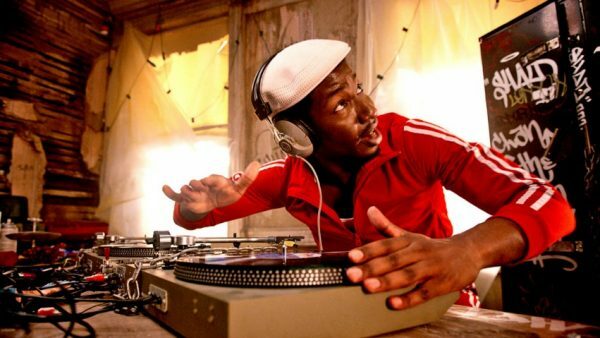 You then had Grandmaster Flash with Mamoudou teaching him not just how to deejay — which is a hard enough skill in itself — but how to deejay the way that Flash used to deejay and make sure that all the movements were the same. He’d be like “Man, you gotta get your knees into it.” He’d have his head down on the table, and his arms had to be exactly right and just the swagger…it was a full embodiment of what Flash was. Mamoudou worked his tail off trying to get there in the end, and Flash loved it. JB: The soundtrack also pretty much covers everything from those disco-funk classics like Lyn Collins’ “Think (About it)” and The Fatback Band to some original hip hop arrangements – setting up the themes for some of these characters. What were some of the things you researched or even looked into when you were beginning to arrange the music for the show? We were incredibly blessed to have music historian Nelson George – who is just a walking-talking encyclopedia, and has literally written the book on hip-hop, soul, and funk. He was one of our associate producers, and a big guiding force. Just being able to speak to the people who were actually there like Grandmaster Flash – a living, breathing embodiment of all that music – and also with Herc, Nile Rodgers…we also had collaborations with Quincy Jones on the project as well. But it really wasn’t just about us doing our own research, it was being able to speak with those people and really get the inside writing on what they were listening to. Flash was fantastic cause he was like “Ah, Elliott, this is my gold here baby! This is my gold! I’m giving you my gold! I don’t tell anybody this stuff.”. [Laughs] They really dug deep in giving us so many of their treasures. Also, our partners with Sony ATV have been amazing at opening up their vaults to us. One of the very special parts of the process is being able to go into Sony while working with Flash and ask for the actual masters — the original multi-tracks — on so many of these recordings and then take, say, a baseline from hits like “Backseat Of My Cadillac”, which has become one of our themes…I can take that and create an orchestral score around it and then give it to Flash, and he would scratch what I’d done into a new sort of version, and we’d give it to someone like Malay or Miguel who would go on to create a new contemporary version of the disco track. That was another way of being able to – I think – take some of that original ethos of what hip-hop was – taking something old and making it new again. That was something we really wanted to make the fabric of what the score sound was going to be. JB: One other standout is “Telepathy” with Christina Aguilera. What was it like working with her on that track? That was an amazing process cause it’s originally a track composed by Sia and StarGate. They sent it in. Baz and I were then working really closely with choreographers Rich and Tone – who’ve worked with Michael Jackson, Madonna, and also with Jose Extravaganza, the choreographer for the original film clip for Madonna. We worked really closely with them, just saying, “if it’s gonna be a vogueing anthem, what’s it got to be?”. We listened to a lot of the music that was being played in the vogue clubs, and we tried to find a feel that would very much live in that era. We created a basic track, and then we obviously go into Christina singing and she just absolutely kills it. Her voice – when you see it up against the image of our lady performer that we have on scene who’s miming to her lyrics – I think you just get a sense of how fantastic and fabulous and amazing the people who were able to participate in those vogueing competitions were made to feel. You forget that vogueing was as underground as hip-hop at that stage. It was for those people, particularly the gay community, which was still being quite prosecuted during that time…For those people to go out and have a place where they were part of their families. To be somewhere where they can celebrate what they were doing was as much an underground movement as any other burgeoning scene at the time. Any project like this is a massive project, and the sheer sweat involved in getting any production of this scale is really just incredible. It’s all you think about from the moment you wake up to the moment you get to sleep. You are living this world for the entire time that you’re working on it. It’s absolutely absorbing, and that is part of what translates onto those scenes. We are trying to create a universe that is as compelling to the viewer as it would’ve been to those kids at the time, and one of the things we kept on getting in all of our conversations with the people who were there was that they really did see it as a magical place. They saw what they were doing as this incredible adventure, which ties into the whole martial arts thing. I think people can see themselves as these young kids – who sort of saw themselves as kung-fu masters – as ninjas – and we tried to reflect that in the scoring, as well as in the way the characters carried themselves. For a kid walking into, say, Le Inferno, we want the audience to understand – in a contemporary sense – what that would’ve felt like going into a place that was that exciting, that dangerous, and the place to be. And to do that, we tried to take the original tracks and heighten them with that new version. Say with the Miguel track, “Cadillac”, or the wonderful remix that got redone by Switch – and then moving that into score so that you did have a more heightened sense of what it was like to be there. That was something we absolutely tried to create on screen. And I think it was reflected in the entire creative process as well. JB: Yeah, I think it’s interesting how you mention kung-fu and graffiti, cause it feels like those elements do elevate what is remembered of the Bronx at that time as some sort of mythic, untethered place – musically and culturally. Parts of the dialogue, at times, even end up taking the form of almost spoken word rhymes that’s reminiscent of a Greek chorus in a way. So, it’s interesting to know the thinking behind that as far as where those ideas had come from. We did try and create a world of magical realism. And part of that is because we’re not creating a documentary. We’re basing it and anchoring it around events that happened during that time – like the black-out – and characters who were there at the time. But the comic culture was so massive back then, and I think it tied so much into the aesthetic of how the kids were operating at the time. That was something we wanted to carry on into the screen. There’s a graphic novel element to it in some ways, which was a very deliberate choice. And I think it helps create that sense of excitement and wonder the kids had about what they were creating during the time. JB: What’s it like working with Nas? How involved is he on the show? Nas has been amazing. His ability to come in and watch an episode…we’d talk about the brief with Baz about what each episode was about, and then he’d go away and just turn in just some of the most incredible…I mean really it’s rap but it’s poetry. And we loved the idea that it’s supposed to be mystical, and to be set broadly in the ‘90s or sometime in some nondescript future. We loved the idea of one hip hop giant from a particular era looking back and building on the work of these giants from ’79, and Nas was so respectful of the history of hip hop. Seeing him work with someone like Rahiem from the Furious Five – who’s really worked closely with us on writing all the other rhymes for so many of the boys’ big numbers. Seeing those two work together was a really beautiful thing. We showed him some very rough images from episode one, and we were obviously sort of nervous cause we hadn’t showed him anything. There’s this scene at the end of the episode where all the boys are sort of getting crowd-surfed around, and Little Boo-Boo is there and he’s getting lifted up on the shoulders of the crowd, and Nas is like “Yo, that was me. I’m Boo-Boo.” I remember feeling like I could see it on his face, he just got it, and it was a pretty beautiful thing to watch. He’s been amazing throughout the entire process. JB: Nowadays, we’re also starting to see some shows like Empire, Atlanta, and now The Get Down, which – on the outside-looking-in – seems to indicate a sudden shift towards wanting to tell hip hop stories in a way that’s never really been done. Why so, do you think? Why now? I think the interesting thing about this particular period we’re investigating, and it’s actually a story that Flash has talked to us a lot about, people know the story of hip hop from when all the records dropped – after “Rapper’s Delight” and Sugarhill Gang. And so, obviously, when they exploded suddenly there was all the money and it became a business. As Flash puts it – people know the cake, but people don’t know the recipe. No one has really told his story of what went into the cake, and how it was initially made up. In a lot of ways, there was very little documentation of that period. So it’s been really about just being able to talk to these people who were actually in the room, and get that story out. As to why it’s never been told before, I mean, I think that’s one of the things that really drew Baz to work. He’s like “Yeah, why hasn’t this been told before?” This is the genesis of the predominant force in our culture at the moment. I think that is what really drew him to tell this story. And I just think that now, particularly with the political environment America has at the moment, is a very valuable time to be sharing this story. JB: I agree. Plus, I feel like hip-hop is so new compared to some of the other genres, so it’s maybe also our way of catching up a bit. Yeah, in some ways. Sometimes it is just a time thing where you need enough distance from that genesis for everyone to be able to sit down and be able to talk about it with enough openness and enough space to get some perspective about the stories that are there to be told. And sometimes it is just a time thing. JB: What are some important take-aways that’ve helped you in your career so far, do you think? There’s two things, I think. One is being able to listen – in any sort of collaboration. Scoring for film is all about really listening. It’s about being empathetic, and trying to hear what story it is that someone is trying to tell. That goes across all mediums. Whether you’re collaborating with Nile Rodgers or Grandmaster Flash or Nas or working with an orchestra or members of The Dap Kings – who we used for some of the funk-inspired stuff that we have on the soundtrack as well – it’s the same. It’s really listening to what the players are saying. What the musicians are playing, what the story is saying. And it’s not until you can actually really hear what the story is that you’re gonna be to be able to produce anything that has that magic quality to it – of one line meeting another. And the other is just – there’s a great quote which Nelson George had reminded me of yesterday and it comes from Quincy Jones. Quincy Jones talks about how aspire isn’t what you think it is. He said Michael Jackson, everybody, all the great artists had it. And it’s just being able to stay in the seat until you get the job done. Being able to stay committed and stick to the job until it’s finished. I think that, more than anything, is what makes a successful career. It’s being able to stick at it. And if Quincy Jones and Nelson George are telling me that, I’m not gonna argue with them. Jennifer Baugh is a Los Angeles-based screenwriter and contributor for The Young Folks. She also writes and draws her own comics and other wonky illustrations over at her personal blog http://jenniferbaugh.tumblr.com.